In the morning you can enjoy a hot shower, do some stretching, or just have your coffee or tea quietly. A hearty breakfast is served each morning at 7:15am, and we leave from the Lodge no later than 8:00am. 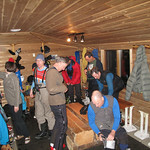 Guests may take their own vehicles or carpool in the convoy to the snowcat staging area, about 20kms north of the Lodge. The Team loads up the cat with all our gear, lunch and refreshments, and then we climb into the cozy cab and embark on our journey to the Mountain’s summit. The weather can vary significantly from valley bottom to mountaintop and we recommend proper layering for the changing conditions. See What to Bring. Oftentimes we ascend through the cloud cover, and once in the upper elevations we experience an inversion, bluebird skies with the clouds forming a sea below us. After a transceiver exercise on the first day, our cat skiing guides lead us down the first run… you’ll hear the whoops and yells of your compatriots as you all swish through sprays of champagne powder, ducking and darting through the trees, and sailing over perfect pillows of snowy bliss. Keep your eyes and ears open for the regroups, and the party will emerge together onto one of the lower cat tracks where the snowcat sits waiting and ready to take us all up again. To maximize skiing time, refreshments are served while we ride in the comfort and luxury of the custom-designed, heated, passenger cab. On warm days, we may pop the convertible-top of the snowcat and enjoy the sunshine! 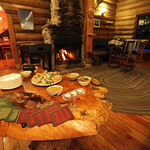 When the skiing is done, we return to the Lodge for an après-ski appetizer, a cup of soup, and general relaxation. Supper is served around 6 or 7pm, and enjoyed all together around our large dining room table. Should you desire, you can fill your evening with a visit to our in-house massage therapist, games around the fireplace, or showing off your photos and videos on our big screen projector. 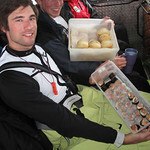 In any case, there will be sweet dreams of deep steep BC snowcat powder!